In the tradition of Saint with White Sleeves, The Beggar Princess and the Magic Rose and Sleeper Lost in Dreams comes Virtue, a beautiful and inspirational message of hope. The graceful young woman depicted may walk a dark path, but with determination and focus as her guiding principles she will surely find her way. 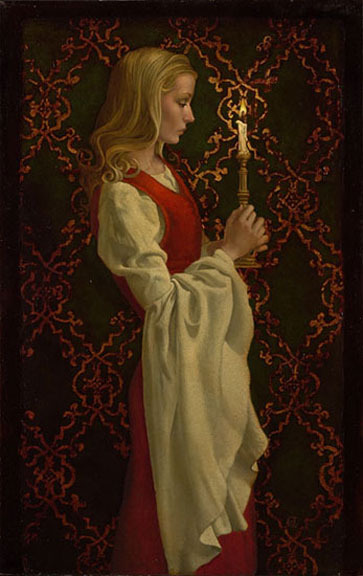 Incorporating one of James C. Christensen’s most popular recurring themes, Virtue serves as a classic and elegant reminder to stay true to your beliefs, that faith and strength will see you through the dark times.